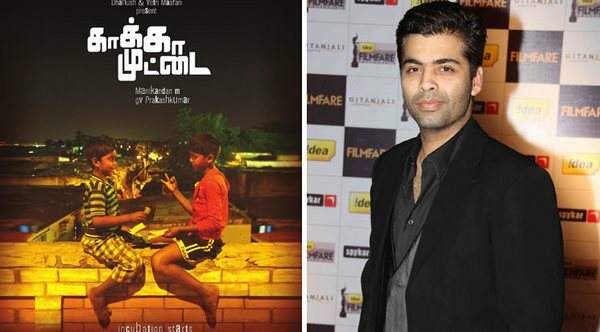 Famous Bollywood filmmaker Karan Johar is the next to appreciate the debutante director M Manikandan for his work in Kaaka Muttai. The National Award winner Tamil children's film 'Kaaka Muttai', which received huge laurels also in international market won rave reviews from audiences and critics alike. Director Karan Johar was moved by the movie, shared his view on Kaaka Muttai on Monday. "Kaaka Muttai is a gem of a film! Genuinely moved by it...Small film....with a huge heart! Congrats @foxstarhindi @dhanushkraja", Karan Tweeted in his microblogging page. Dhanush and Vetrimaaran produced Kaaka Muttai was released all over India by Fox Star Studios on June 5th. Aishwarya rajesh, Ramesh, Vignesh played central roles in the movie. Kaaka Muttai collected Rs. 2.4 Cr in first weekend and running successfully to packed theaters. It is to be noted that Karan Johar is distributing SS Rajamouli's Baahubali in Hindi, while KE Gnanavelraja does it for Tamil audiences.